Zimbabwe’s first lady Grace Mugabe returned home from South Africa early yesterday, pursued by demands she face prosecution over an alleged assault of a 20-year-old model. Gabriella Engels, who claims to have been assaulted by Grace Mugabe, arrives for a news conference in Pretoria, South Africa, August 17, 2017. Zimbabwe’s first lady Grace Mugabe returned home from South Africa early yesterday, state media said, pursued by demands she face prosecution over an alleged assault of a 20-year-old model in an upmarket Johannesburg hotel room. Police placed border posts on “red alert” to prevent her from leaving but South Africa’s international relations minister said she had granted diplomatic immunity to the wife of Zimbabwe’s 93-year-old President Robert Mugabe. “I hereby recognize the immunities and privileges of the first lady of the Republic of Zimbabwe, Dr Grace Mugabe,” the minister, Maite Nkoana-Mashabane, said in a notice published in South Africa’s Government Gazette yesterday. The president and first lady arrived in Harare aboard an Air Zimbabwe plane in the early hours of yesterday. 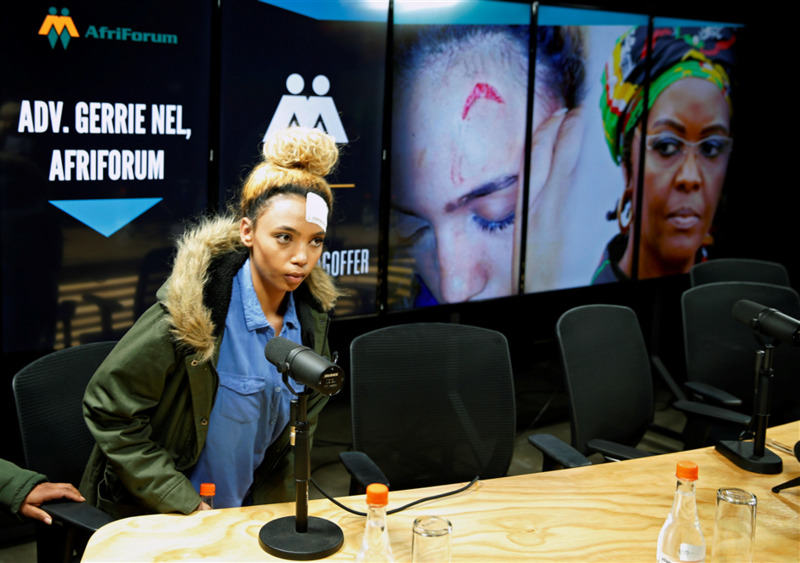 Nkoana-Mashabane’s order, signed on Saturday, has gone down badly in online forums in South Africa, where August has been designated Women’s Month to highlight concerns around gender violence and abuse. The opposition Democratic Alliance said it would call for a parliamentary inquiry into the affair, while advocacy group Afriforum said it would challenge the government’s decision. “We will now take the decision on review and to see if we can have the immunity revoked,” its legal affairs spokesman Willie Spies said. The group has given legal backing to Gabriella Engels, the woman behind the assault allegation, and is working on the case with Gerrie Nel. He was the prosecutor who secured a murder conviction against Olympic and Paralympic star Oscar Pistorius. Engels has accused Grace Mugabe of whipping her with an electric extension cable a week ago as she waited with two friends in a luxury hotel suite to meet one of Mugabe’s adult sons. President Mugabe attended a South African Development Community summit in Pretoria on Saturday, but his 52-year-old wife was not there or part of his delegation. South Africa’s main opposition Democratic Alliance blamed the ministers of police, international relations and defense for a failure to detain Grace Mugabe. “The DA will be demanding an immediate parliamentary inquiry into government’s complicity in allowing Zimbabwean first lady Grace Mugabe to flee the country in the dead of night to avoid criminal prosecution,” John Steenhuisen of the DA said in a statement.